Beautiful german silver pendent necklace with pink cotton cord. We are supplier of Fancy Jewellary. We are among the reputed organizations, highly engaged in providing an optimum quality range of Wedding Floral Jewellery. Owing to our extensive knowledge and experience, we are a renowned organization in the industry occupied with offering a trendy range of Ladies Bags and clutches . Diamond Fancy Jewelry Aprox 1.5ct daimond. 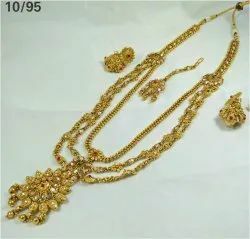 We hold proficiency in offering a wide range of Fashionable Jewellery Set. Due to the worldwide quality norm, these products are known in the market.